Cone crusher is the metallurgical industry, building materials industry, road construction industry, chemical industry and silicate industry commonly used in crushing equipment. Can be used to break a variety of medium and above the hardness of the ore and rock. Cone crusher is commonly used in crushing ore processing equipment,Shanghai Joyal mining machinery reminder users should pay attention to cone crusher in the course of some problems that may occur, in particular, should pay attention to cone crusher adjustment sleeve loosening phenomenon . Cone crusher in the process of crushing ore loose set of adjustment phenomenon, the general reasons for this situation are what? 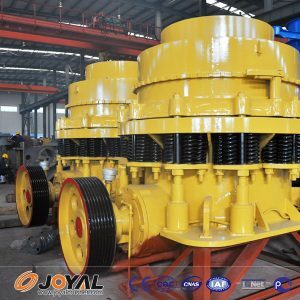 Joyal mining machinery is a professional manufacturer of ore processing machinery and equipment, and here to talk about simple cone crusher adjustment sleeve loose phenomenon of what are the reasons. The general installation of the new cone crusher locking sleeve and the gap between the adjustment sleeve is 12.5mm, according to the adjustment ring and locking ring thread wear, appropriate to enlarge the gap between the two, increase the locking stroke. However, when the cone crusher crushes the ore for a long time, serious thread wear may occur, resulting in improper clearance between the locking sleeve and the adjusting sleeve, which may cause looseness of the adjusting sleeve. Cone crusher locking ring and the adjustment ring is connected with four M27 bolts, when the device into the impurities or feed particle size is too large, the cone crusher overload led to the lock bolt fracture, resulting in lock failure caused by the adjustment Loose sets; cone crusher crushing wall and rolling acetabular wall too thick will make the adjustment sleeve loose, so when the crushing wall wear do not take welding method, you should replace the crushing wall and rolling acetabular wall.